With Wi-Fi, a built-in speaker and microphone and powered by Intel's Atom. That's Asus prototype Eee Keyboard which actually could solve the age-old problem of getting your media from PC-land onto your shiny HD TV. You can display photos on your TV, as well as launch programs from hot keys. And, basically, it's a self-contained PC. Wow. The device's pièce de résistance is its 5-inch touchscreen, which uses icons to launch apps such as an image viewer and calendar. We got hands on with it – well, as much as the Asus representative would allow – and had a fiddle with the screen and icons. The keyboard itself is clean brushed aluminum. 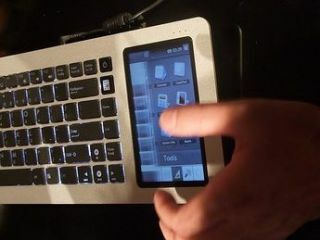 The idea is that the keyboard can connect to basically any device wirelessly, whether a monitor via a HD Display Wireless Connection or an HD TV. The slab also boasts Wireless HDMI over Ultra Wideband. The technology for this isn't exactly prevalent, but the idea of it excites far more than the half-arsed digital home kit peddled by most companies. Other specs are currently sketchy, though we're mightily impressed with the look and feel.